Originally named “Floranada” (a blend of Florida and Canada), the town was forced into bankruptcy after the hurricane of 1926. 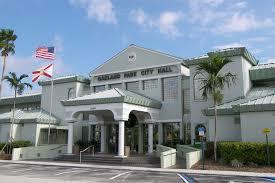 When the municipality reincorporated, residents chose to make it a city and voted for the name “Oakland Park.” The original boundaries went from the Atlantic Ocean, west to what is now U.S. 441, and from the north fork of Middle River north to Cypress Creek Boulevard, but when the boundaries were reestablished, it was to approximately the west side of U.S. 1, west to Northeast 3rd Avenue and the north fork of Middle River north to what is now Prospect Road. Over time, it has expanded to its current boundaries, mainly due to acquiring a few other areas, such as recent annexations of previously unincorporated neighborhoods of Twin Lakes South and North Andrews Gardens.